On March 26, the House Environmental Resources and Energy Committee, by a party line vote (Republicans supporting), reported out House Bill 827 (Fritz-R-Wayne) requiring compensation to landowners for their drilling rights if the Delaware River Basin Commission adopts a ban on fracking primarily affecting Wayne County and Northeast Pennsylvania. Rep. Jonathan Fritz (R-Wayne) said the legislation would cost a minimum of $10 billion. The Senate sponsor of similar legislation-- Senate Bill 305-- referenced a 2011 University of Delaware study which found the mean value of potentially recoverable natural gas from the Marcellus Shale formation in the Delaware River Basin is projected to be $30.4 billion, but it could be as high as $52 billion (page 91). Since 1988, Pennsylvania has been responsible for 25 percent of the Delaware River Basin Commission’s budget. No funding is provided in the bill for Pennsylvania’s share of this cost to state taxpayers. 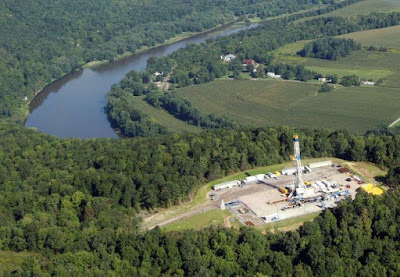 Rep. Greg Vitali (D-Delaware), Minority Chair of the Committee, noted the supporters of this legislation voted for a ban on developing the South Newark Shale in Southeast Pennsylvania as part of Fiscal Code amendments in 2017. Rep. Vitali also quoted a letter from DEP as saying the proposed DRBC action does not ban oil and gas development, but one recovery technique-- fracking. Rep. Kathy Rapp (R-Warren) noted counties in the Southeast part of the state that are against fracking have no trouble taking Act 13 drilling impact fees, which last year was $50 million or more, generated by areas of the state now doing drilling. -- House Bill 828 (Fritz-R-Wayne) authorizes DEP to issue one permit for multiple gas wells on a single pad instead of individual well permits, extends the term of well permits from 1 to 3 years and allows well locations to vary within 50 feet of specific locations identified on the well permit (sponsor summary). These reforms were included in a DEP white paper Gov. Wolf released in January of 2018. Rep. Vitali noted DEP supports the concepts in the bill, but it does not support the bill as written because it does not include the existing safeguards included the Oil and Gas Act. He also express concern about the fiscal impact of the bill since one permit per well pad would replace a per well permit which could include 8 or more wells each required to pay a permit fee now. --House Bill 829 (Fritz-R- Wayne) prohibiting the Delaware River Basin Commission from regulating onlot septic systems (sponsor summary). Rep. Vitali said DRBC has not and does not plan to regulate onlot septic systems. The bill he said, is a solution in search of a problem. The Committee held a hearing on issues involving House Bill 827 and 929 on March 20. Rep. Daryl Metcalfe (R-Butler) serves as Majority Chair of the House Environmental Committee and can be contacted by calling 717-783-1707 or sending email to: dmetcalf@pahousegop.com. Rep. Greg Vitali (D-Delaware) serves as Minority Chair and can be contacted by calling 717-787-7647 or sending email to: gvitali@pahouse.net.